QMS & Documentation: Candidate should be MSc / M.Tech / M. Pharm with 1-5 years of relevant experience in Quality assurance of Biologicals or vaccines. Should have knowledge on QMS elements- Change control, Deviations, Out Of Specification and CAPA systems, Issuance, Version control, retrieval and archival of documents and have expertise with Investigation mechanism and tracking the timelines. IPQA: Candidate should be MSc / M.Tech / M. Pharm with 6-9 years of relevant experience in Quality assurance of Biologicals or vaccines. Should have knowledge in line clearance, process compliance monitoring, GMP and contamination control and cross contamination control. 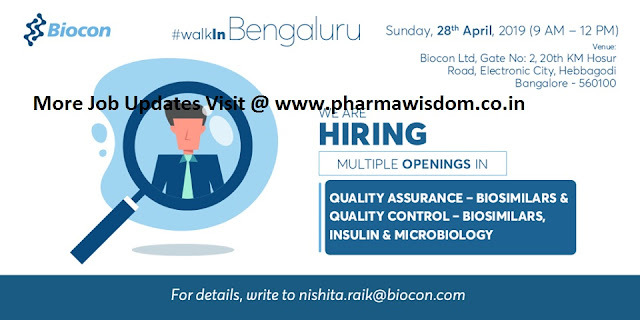 Candidate should be M.Sc /M.Tech / M. Pharm with 1-5 years of relevant experience in Quality Control of Biosimilars (MABs). Should have exposure to Analytical techniques or Bioassay with knowledge on CGMP, GLP and GDP practices. Candidate should be MSc microbiology. with 1-12 years of relevant experience in Quality Control Microbiology lab Should have exposure to Environment monitoring, Sterility Testing, BET, MLT, Analytical method validation, Protocol preparation , SOP writing, Data review with knowledge on CGMP. Candidate should be MSc / M.Tech / M. Pharm with 1-5 years of relevant experience in Quality Control(DS/DP) and should have hands-on experience on Raw material sampling and analysis, Finished product and stability testing . Should have exposure to Analytical techniques (HPLC,GC,UV,IR,KF etc..) with knowledge on CGMP, GLP and GDP practices. Candidate should be MSc / M.Tech / M. Pharm with 6- 12 years of relevant experience in Quality Control(DS/DP) and should have hands-on experience on Raw material sampling and analysis, Finished product and stability testing. Should have exposure to Analytical techniques (HPLC,GC,UV, KF, IR,AAS etc..) with knowledge on CGMP, GLP and GDP practices. Hands on experience on OOS, Laboratory incidents, Deviation and OOT investigations. Team & people management Skills. Qualifications of analytical instruments and Stability cold chambers. Note: All positions are based in Bangalore & would require working in shifts. Candidates should bring two passport size photos, two copies of their CV, payslip, copies of educational certificates, previous work experience certificates & salary annexure.